Picking up or expecting a new camera for Christmas or Hanukkah? Congrats, and honestly, we’re a little jealous. But let’s not let that get in the way of helping you figure out which cable you need to tether your new equipment to your computer. Now that you’ve gotten your shiny, new camera out of the box it’s time to pick up the gear you’ll need to start shooting like a pro. It’s important to note that while you might already have a TetherPro Cable for your old camera, not all cameras use the same cable connectors. The first thing you’ll want to do is head over to our Camera Compatibility Guide and enter the Manufacturer and Model of your camera. You’ll be presented with two options, the cable you need, as well as a Starter Tethering Kit. Let’s take a look at the Starter Tethering Kit, the easiest way to get started tethering. Here’s what’s included in the kit. If you’re shooting tethered using the Starter Tethering Kit or a TetherPro USB Cable, it may be time to upgrade to a secure, stable table for your tethered workstation. In 2018, take your photography and professional image to the next level by enhancing productivity, improving efficiency, and increasing safety in your workflow. 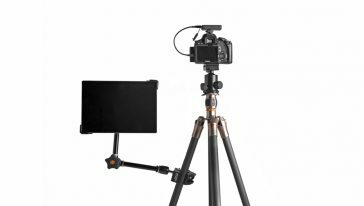 With the Pro Tethering Kit, start with any tripod, lightstand, c-stand, or arm and add a Tether Table laptop platform and accessorize and customize the setup as you see fit. Lightweight but strong, with four unique mounting options and a wide variety of accessories, the Tether Table Aero is backed by a Lifetime Warranty. The Tether Table Aero Traveler is great for the photographer who’s on the go. Need a laptop table that is lightweight, doesn’t take up too much space, but is big enough to hold your laptop? Look no further than the Aero Traveler. This heavy-duty custom storage bag is constructed of the highest quality pack-cloth material. The zipper closes at the top to protect your table from the elements and bag features handle straps for easy transport.